Vera is the blogger behind one of the most popular interior design blogs in Germany, Nicest Things. Vera tried out RoomSketcher, recreating her own beautiful living room, testing out different RoomSketcher functions and features, and even managed to avoid a wall color disaster! Here are her thoughts on RoomSketcher. I wonder why I’ve never discovered RoomSketcher before! It’s a must have if you’re like me: crazy for renovation, redecorating and refurnishing! All you do is log in and you’re ready to start! You can create floor plans, choose flooring and wall colors, play around with different furniture and decorate… And then you can see everything in 3D! 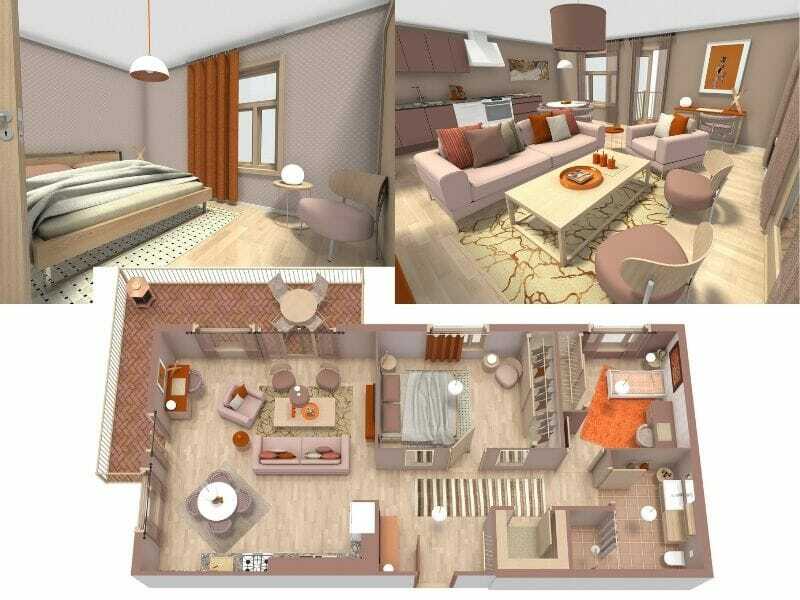 Below, you can see parts of our living room, followed by 3D snapshots of my design in RoomSketcher. 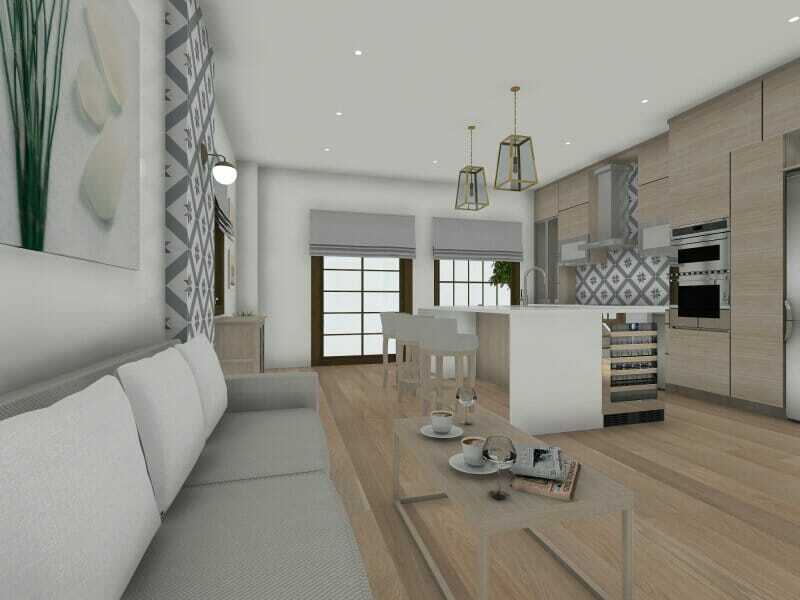 It’s amazing how detailed you can be when you’re planning or redesigning your apartment, especially as you need zero technical knowledge to use the tool! You simply draw up your floor plan, put in windows and doors, drag and drop furniture into the floor plan, and rotate and move them as you want… It doesn’t require more than a few clicks. As you can see, there’s quite a lot of real brand furniture in RoomSketcher from companies and designers you’ll know of. The product library contains everything from classic and well-known Ikea items like the Expedit shelves, to more high-end items like Marimekko pillows, Smeg fridges, Arne Jacobsen chairs and even Kitchen Aid appliances, and the library is constantly being updated with new items! You get a really good impression of your space with this tool, and you can try out all the different things you’ve been dreaming of, and see the changes immediately! Below, you can see the Home Designer drawing pane. In the drawing pane, you can create a floor plan by simply drawing up the walls using your mouse. At the bottom, you’ll find the different tabs for drawing walls, choosing materials, finding the right windows and doors, and furniture, fixtures, and decoration. Just drag and drop the item you want into the floor plan where you can move them around, rotate them and resize them. I really like the little green camera that can take 3D snapshots of any part of your design. These images can be stored online, making them easily accessible to you, and you can also download them to your computer. As I mentioned before, all this, including the 3D snapshots, is free. But you can also upgrade to a paid VIP account, to get additional 3D Walk where you can walk around your floor plan. With a VIP account, you can also download an app for your phone and tablet, and you’ll get even better resolution on the pictures. And here’s another reason why I love RoomSketcher! You can paint a room (and undo it) in just a couple of seconds! I was once on the verge of painting the living room white. This was until my darling man pointed out that white furniture looks much better when it’s contrasting a gray wall rather than a white one. Well, I’ll admit, I wasn’t really going to go through with it, but sometimes a change is just so appealing. It really helps to be able to first create the room in RoomSketcher and visualize what it will look and feel like. You’ll soon see if you think the color works for you or not, and if it doesn’t, you’ll be so happy it was only done online! For example, below, you can see our living room painted in a mint green color. This is certainly a possibility, but it is not the color for me! The picture with the mint green walls also shows you the image quality you get with a free version of the tool, and I think it’s actually pretty good! So, as you might have realized, I really like RoomSketcher. It’s not only a useful and beautiful tool for people interested in interior design and decorating, professional designers, stylists and real estate agents, it can also help you avoid disasters (keyword: white walls in the living room, it looked so bad I didn’t even want to show it here). I hope you find this tip useful, maybe you have a home project where you could benefit from using RoomSketcher? Want to try out RoomSketcher yourself?